Obesity is increasing in epidemic proportions worldwide especially in developed countries. According to the the Global Burden of Disease Study 2013, India is just behind the US and China with about 30 million people in the country being obese and around 20 per cent of school-going children being overweight. Among all the Indian states, it was found that more than 40 per cent of the population in Punjab is overweight or obese, in a first-of-its-kind study conducted by Post Graduate Institute of Medical Education and Research and Punjab government hospitals. The country has been battling with obesity for a while now but the plight of this morbidly obese baby girl in Punjab is somewhat disturbing. 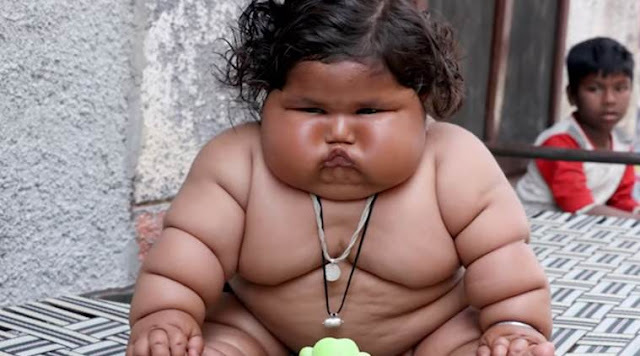 Eight-month-old Chahat Kumar who weighs 17 kgs has doctors worried. In case you are wondering what’s all the fuss about, let’s tell you that it is what an average four-year-old child would weigh. After noticing her dramatic weight increase her parents sought out medical help but treatment wasn’t possible as the doctors couldn’t get a proper blood sample. Her excessive weight has led her to have breathing and sleeping problems.